The Palestinian Authority has signed an agreement saying it will pay 570 million shekels to the Israel Electric Corporation (IEC) in order to pay off its debt. The rest of the debt will be paid off in 48 installments. 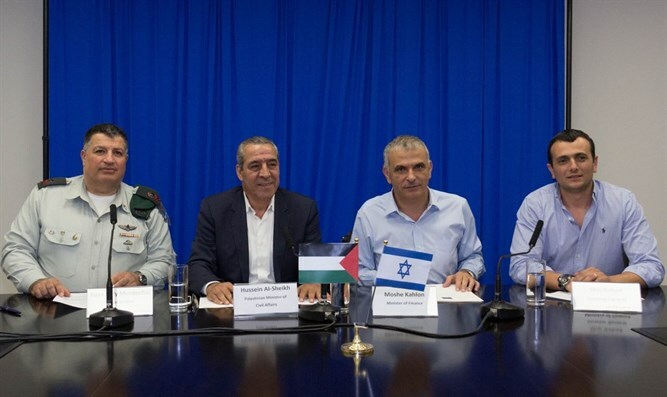 The agreement was signed by Maj. Gen. Yoav Mordechai, Israel’s coordinator of government activities in the territories, and PA Civil Affairs Minister Hussein al-Sheikh. It was achieved after almost a year of negotiations involving Finance Minister Moshe Kahlon, senior Finance Ministry officials, COGAT officers, and Palestinian representatives. The agreement will erase hundreds of millions of shekels of the debt, which currently stands at close to 2 billion shekels ($530 million). The PA acquires 95% of its electricity in Judea and Samaria and 75% of its electricity in Gaza from Israel. The Israeli supply to the PA-assigned areas has continued over the years despite the huge debt and despite the fact that Hamas continues to carry out terror attacks aimed at Israeli forces and civilians alike. Last year, the IEC issued a final warning to the PA to pay its debts within three days or be disconnected. The threat was not carried out until a year later when the IEC intermittently limited electricity to the PA – a move which raised the ire of the US State Department.